Well this is old stuff and several applications with much more functionalities are probably out in the play store but just decided to post it here because it proved useful while playing with older android OS. Follow the steps below to enable installation of new softwares to the SD card on the android phones by default (Tested on android 2.2). Note: "get pmInstallLocation" can be used to query for the available locations you can install softwares to. 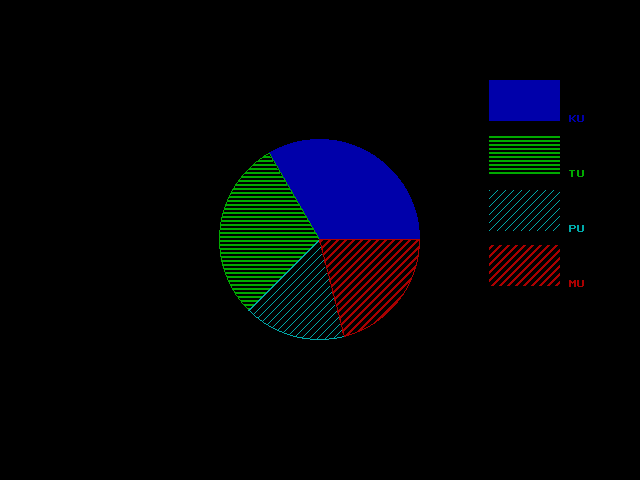 This is a very simple implementation of pie chart in Turbo C. The source code is quite easy to read through so must not be the big problem understanding the code. This implementation makes use of pieslice() function which draws and fills the pie slice with centre x, y and radius r. The function also requires the start angle and end angle. Today, result of SLC exam 2069 was published and the first batch of Iris Academy secured 100% result with 50% distinction. Although being a relatively new school in Makar-2, Chisapani, Nawalparasi, Iris Academy secured the best result in the area. We would like to congratulate all the SLC appeared students and the Iris Academy and wish for the bright future ahead. Well we are doing our labs based on the traditional Turbo C++ IDE and I decided to write this blog post with the information on how I installed it on my Ubuntu box. 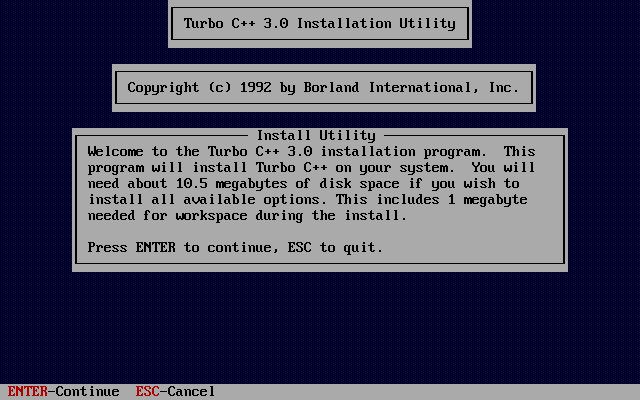 First thing first, download Turbo C from internet. For your ease, I've uploaded it HERE. 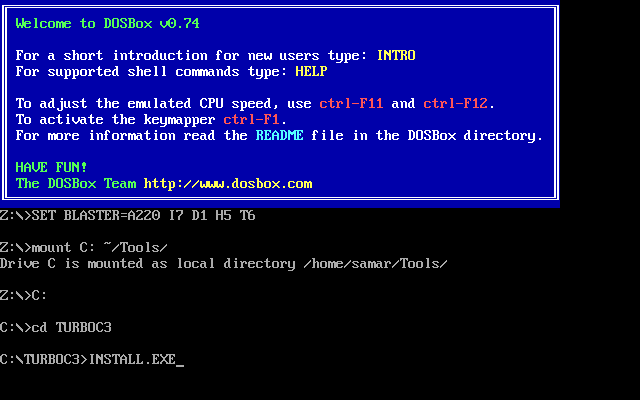 Once you install dosbox, unzip the content to somewhere in your $HOME directory. 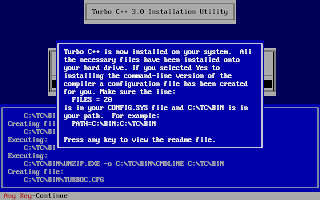 In my example, I unzipped the content of the Turbo C zip file into ~/Tools/TurboC3/. 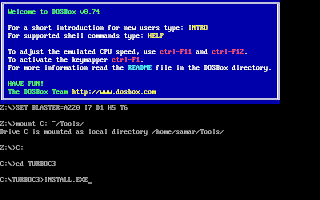 Now launch the dosbox by typing dosbox in the terminal. A dosbox emulation window will appear which will look like your old DOS system. 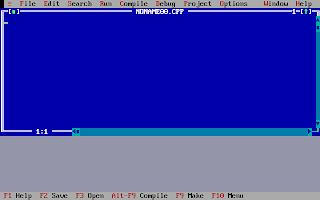 Adding this entry will run the above commands during the startup of dosbox thus giving you the Turbo C IDE interface directly on running dosbox. Well this post consists of the source code for very very simple line drawing using the in-built functions. I hope it proves useful for learning purpose. Here is the source code that makes use of the traditional DOS mode graphics to implement the Bresenham line drawing algorithm for the lines with slope |m| < 1. 1) Input two points (x1, y1) & (x2, y2). 2) Determine the differences dx = x2 - x1 and dy = y2 - y1. 3) Calculate the initial decision parameter P0 = 2dy - dx. b) Pk+1 = Pk + 2dy - 2dx. 5) Repeat step 4 for dx time. Make sure to provide an appropriate path for graphics library. 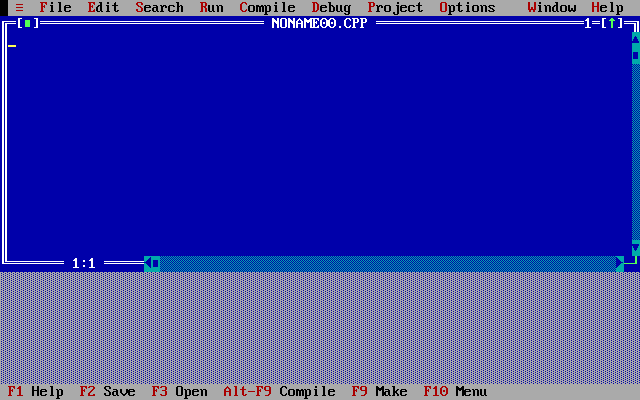 Here is a source code in traditional Turbo C that makes use of old DOS mode graphics to implement the digital differential analyzer. 3) Choose step size as the bigger value between the absolute values of dx and dy. 4) Determine x-increment = dx/step_size and y-increment = dy/step_size. 5) Start from (x0, y0) = (x1, y1). I do this thing on a regular basis to know if my account got compromised or not. Well I understand the risks imposed by logging in to my gmail account but still due to several circumstances, I have to login from public PCs. Though I employ some other techniques to trick possible keyloggers/RATs, etc. I do keep running from the dangers of account hijack and hence keep on regularly checking the account history details in gmail. 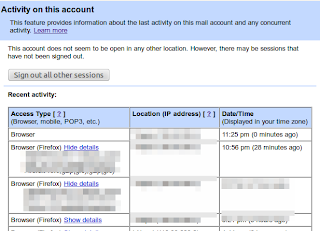 Moreover, it seems like that the details now include the user agents and/or access type information along with the IP address and time of access to the gmail account. If you're concerned about unauthorized access to your mail, you'll be able to use the data in the 'Access type' column to find out if and when someone accessed your mail. For instance, if the column shows any POP access, but you don't use POP to collect your mail, it may be a sign that your account has been compromised. For more information, refer to this page. 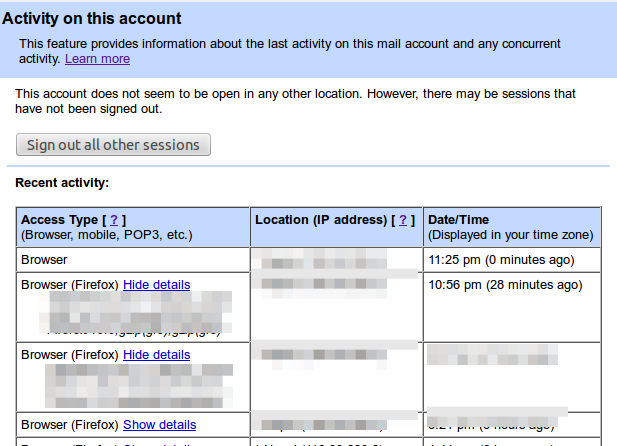 Moreover, this feature lets you log out all of your sessions other than the current session. This can come quite handy whenever you have forgotten to sign out or someone else is having an unauthorized access to your account. If you wish to perform encrypted file transfers, openssl provides a robust implementation of SSL v2/3 and TLS v1 as well as full strength generic cryptographic functionalities. Available for almost every commonly used operating system, openssl can be used as a general purpose tool instead of looking for other specialized tools. If you wish to have full strength cryptographic functions, openssl is a perfect choice. Forget about all other tools that promise to provide high end encryption for your confidential data. Openssl is more than enough for most of your cryptographic needs. Personally, I can't just rely on some random software that promises to provide full strength cryptography but lacks documentations and detailed reviews. Openssl, however, has a well structured documentation and is an open source implementation. Openssl supports several ciphers such as AES, Blowfish, RC5, etc., several cryptographic hash functions such as MD5, SHA512, etc., and public key cryptographies such as RSA, DSA, etc. Openssl has been widely used in several softwares most notably the OpenSSH. If you are quite worried about your privacy while making voice calls on your phone, RedPhone is a perfect tool to install in your android phone. RedPhone ensures that the eavesdropping attackers can not sniff your call by providing end-to-end encryption. RedPhone is an open source communication encryption android software that well-integrates with the system dialer and lets you use the default system dialer and contacts apps to make calls as you normally would. The tool is written by Maxie Morlinspike, the same guy who wrote a famous tool called SSLStrip for performing HTTPS stripping attacks. It is an open source tool licensed under GPL v3; the github README says, RedPhone is an application that enables encrypted voice communication between RedPhone users. RedPhone integrates with the system dialer to provide a frictionless call experience, but uses ZRTP to setup an encrypted VoIP channel for the actual call. RedPhone was designed specifically for mobile devices, using audio codecs and buffer algorithms tuned to the characteristics of mobile networks, and using push notifications to maximally preserve your device's battery life while still remaining responsive. If you wish to understand more on Encryption protocol, you should refer to the WIKI. If you are looking for good computer based learning materials for your small children, e-paaath (E-/Online Lesson) is a perfect choice esp. for the Nepali education scenario. I don't know how much has been done to take this software to the reach of the students/children but I think this software can be a very useful interactive learning material for children. Developed by OLE Nepal in collaboration with the Department of Education (Nepal), this web-based software provides several modules of online lessons for classes 2-6. The software consists of 18-30 lessons organized in a weekly fashion for four subjects: Nepali, English, Mathematics, and Science. The contents for science are available in both English and Nepali languages. However, mathematics is available only in Nepali language. E-paath is a flash based content and hence requires flash player and can be run through any of the major web browsers such as Mozilla Firefox, Google Chrome, etc. Since e-paath is a web based content, you can run it in any platform without any problem (I had to change a little bit of code in karma.html file to run the tool smoothly in Linux but its still fine; having a web server to serve the pages solves all errors though). You can download e-paath from HERE. 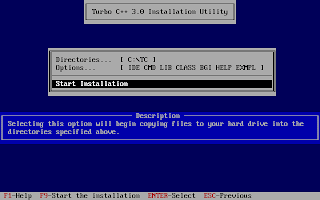 For installation help, you can refer to this page. You can also access the software online from HERE. Btw, there is no specifically linux version of tool available in the website (except for Sugar desktop environment) and don't try to mirror the online version of e-paath as flash contents seem to be internally referencing the configuration files. Your best bet is to download either of the two available versions and then delete all the unnecessary stuffs in there. It just runs fine. In this tutorial, we will learn to redirect our TCP traffics through the chain of proxies using a well known tool named ProxyChains. ProxyChains is a tool for tunneling TCP and DNS traffics through chain of several proxy servers which supports HTTP, SOCKS4, and SOCKS5 proxy servers. Hence, this tool leverages several usages such as anonymity, bypassing filters, running any program through proxy servers, etc. Once you have installed the proxychains, you need to configure this tool. The global configuration file is located at /etc/proxychains.conf so if you wish to have your own configuration file, you could either create the proxychains.conf file in the current working directory or at $HOME/.proxychains/proxychains.conf. First, we will have to select the kind of chaining option we want to use. We can use one of the dynamic_chain, strict_chain, and random_chain chaining options. In most cases, it is good to just use the dynamic_chain so we uncomment the line containing dynamic_chain and comment all other chaining options. P.S. If you are interested in some GUI for using proxychains, you can use ProxyChainsGUI. Lastly, the default package from Ubuntu repository seems to be missing the proxyresolv command so I would recommend to compile the source code locally. Ncell has introduced yet another offer, the Paisa Double for all the prepaid and pro classic customers which will be available for next eight weeks. With the Ncell's Paisa Double offer, you will be able to double the said amount. Ncell says that it is a new offer that acknowledges the loyalty of Ncell customers by providing them various amounts to double. Dial 1212 and listen to find out what amount you can double. Then press 1 to get the double of the said amount. Alternatively, you can also dial *1212# and press 1. After you press 1, the said amount will be deducted from your main balance and the double of it will be added as your Paisa Double balance. While the offer sounds great, it is only applicable within Ncell network. You can use the Paisa Double balance to make calls, send SMS and MMS within Ncell network and even to access internet. You can subscribe Ncell Paisa Double offer only once and it will be auto-renewed every week until you deactivate or till the offer ends. Dial *101# to know your remaining Paisa Double balance. If you wish to deactivate the service, type R and send it to 1212 through SMS. However, you can again activate if you wish within the offer period. You can use the old grep command or the small script using the pdftotext command to search text over multiple pdf files but we are talking about a simple utility that lets us to search text in PDF files. The pdfgrep tool lets you perform grep style search over multiple pdf files easily from the terminal. It depends upon the poppler package and under ubuntu, you can just type the command below to install pdfgrep. Well I came across this online tool which lets you compile your greasemonkey scripts which we commonly call User Script into a working firefox extension. Hence I decided to share the link. Yesterday I came to know that I can listen Swasthani online at this site, www.swasthani.com and I decided to write a swasthani audio downloader. Since it would be useful for everyone, here is the script. From the site itself, Sri Swasthani Brata Katha is a very popular ritual observed in Nepal in the Poush month (January – February) during winter. Goddess Sri Swasthani, known to grant wishes of her devotees, is worshipped for the whole month of Poush. The Swasthani Brat Katha (story) is recited everyday. The month long telling of the tales are dedicated to the Goddess and the stories that are mainly narrated are those of Swasthani Devi, Lord Shiva and other Gods. In this post, you will get to know about a simple command that lets you know what groups the particular user belongs to. Users and groups are the one of the several concepts employed in the Linux systems for access control. This post provides the information regarding how to use the PRBT system provided by NCell. PRBT service enables the ones who call you to listen to a popular melody or sound instead of the regular tone. The sound or melody is heard by the caller till the call is answered. Your friends and partners, regardless of operator, location and phone model while calling you can hear melodies, sounds and personal greetings chosen by you instead of usual phone tone. Q2. How to activate PRBT service? II. IVR: Dial 9208 and follow the instruction. III. USSD: Dial *100*2# and follow the USSD guide instruction. Q3. How to set a PRBT? Any PRBT of your choice can be set via SMS, IVR or Web once the user has activated the PRBT service. Stated below are the ways a subscriber can set a PRBT. I. SMS: Type BUY PRBTcode sends it to 9209. III. IVR: Dial 9208 to choose the tone of your choice. Q4. What are the features with new PRBT system? a. Assign different PRBT to different callers. b. Create Group and allocate a PRBT for a group. c. Play different PRBT in different time slots. d. Copy a PRBT from a friend. Q5. How much does a PRBT cost and what is the validity? Each PRBT will attract Rs. 10 excluding the taxes. Q6. Is there monthly subscription price? Yes. There will be Rs 10 monthly subscription price without applicable taxes. The subscription will be renewed automatically unless the subscriber chooses to discontinue the service. Subterfuge is a very useful tool for hackers and security experts for automating the man-in-the-middle attacks. It provides a complete framework for automating different kinds of MITM attacks. Subterfuge largely transforms the complexity of performing the man-in-the-middle attacks with the tools such as ettercap and makes it far more easier to launch various form of MITMs. Hence, even a general computer user can perform MITM using this tool. Subterfuge provides a very clear interface accessible over HTTP through browser through which we can view the intercepted authentication data. The tool also supports several other form of MITM attacks such as session injection, http code injection, fake AP, and DNS spoofing. Currently, the 4.3 beta version of this tool is available as the latest release. You can download the tool and read about the tool at code.google.com/p/subterfuge. This post provides the source code for simple and naive integer sorting algorithm by exploiting the dynamic memory allocation feature of C programming. This post provides a source code for matrix multiplication by dynamically allocating memory for matrices to be multiplied and multiplication of those matrices. Here is the source code in C that makes use of DMA function malloc() to dynamically allocate the memory for matrices and find their sum. Below is a sample run along with the compilation step. This snippet utilizes the dynamic memory allocation function, malloc() and finds the transpose of the user provided matrix. Security researchers have discovered yet another critical Java 0-day exploit being used by majority of the browser exploit packs such as Blackhole and Cool. Users are urged to DISABLE the Java plugin RIGHT NOW. French researcher Kaffeine discovered that the java 0-day has been spotted to be making big hits daily, in a blog post. This particular exploit has proven to be very serious threat for the users. The folks at AlienVault Lab have also reproduced the exploit and it seems to work over all the java versions across all platforms which is a very serious threat. As for now, the users are highly urged to disable their JAVA plugins right now so that they do not get hit by these 0-days.